Polls Shmolls: We Can Win This! Eeyore stood by himself in a thistly corner of the forest, his front feet well apart, his head on one side, and thought about things. Sometimes he thought sadly to himself, "Why?" and sometimes he thought, "Wherefore?" and sometimes he thought, "Inasmuch as which? "—and sometimes he didn't quite know what he was thinking about. Yes, that. Eeyore's gloom prevents him from seeing anything clearly. Having ascertained that he has, in fact, lost his tail, Eeyore attributes monumental significance to it. This is also the problem with polls, especially when coupled with too little sleep. They're just somebody's idea of what maybe might be occurring at a given moment before an election, give or take a few thousands. Even well-conducted polls amount to a more or less educated guess. Who knows what will influence fence-sitting voters? When they themselves don't really know just what they're going to do, the people making predictions are blowing a certain amount of smoke. And that smoke can cloud your vision. Those who appear to be ahead, even by a negligible margin, rejoice, while an impending sense of doom spreads over those who appear to be behind, even by a sliver. Any change from an earlier poll, however minuscule, may be taken as a trend. The effect of the poll is to say, more or less, that the race is over, it's a done deal, and here are the results. But it's not over. A lot can happen in just a few weeks, and the results are as yet undetermined. Regarding the illustrious Marquette poll for May, some regard it as valid, and others caution us not to start counting the Republican chickens, recognizing that the unprecedented nature of this election means that all bets are off. The polls are trying to predict politics as usual. The parties are doing their best to maintain politics as usual. But given all that we've done to organize and mobilize and make this election happen, this is anything but politics as usual. We do know that the race is likely to be close, so every small thing we do has the potential to significantly affect the outcome. We've no time to tromp about looking for the donkey's tail. We have invested too much of ourselves in this race to take the spin and drivel of polls and right-wing media to heart. We have already accomplished so much more than anyone would have thought possible just a year and a half ago. Now is the time for courage, good humor, plenty of sleep, action, and solidarity. We are fighting for justice, truth, freedom—all the biggies. We are on the side of the angels. The order of the day is to keep our eyes on the prize and keep working our butts off. Heather DuBois Bourenane over at Monologues of Dissent has some excellent suggestions for boots-on-the-ground action in these last few weeks. When Chistopher Robin had nailed it on in its right place again, Eeyore frisked about the forest, waving his tail so happily that Winnie-the-Pooh came over all funny, and had to hurry home for a little snack of something to sustain him. Embrace the blue donkey, tail and all, and repeat after me: We can win this! A few weeks ago I went with a friend to Miller Park a couple of hours before the start of a Brewers game to gather signatures to help Kathleen Vinehout get her name on the ballot for the May 8 recall primary. 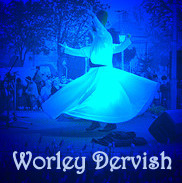 Being a dyed-in-the-wool introvert, I had never done anything like this before. It was like a brief, intense peek into a microcosm of Wisconsin. Unsurprisingly, most were drinking beer, eating brats and cheese, and generally in quite the festive, boisterous mood. It was heartening to hear many ask specifically about Vinehout's support for teachers. They perceived Walker's attack on teachers as a serious affront and were only interested in helping candidates who would strongly support public education and teachers. Of course, there were a couple who had to yell "Support Walker" at the top of their lungs, but mostly people were quite pleasant. I approached one young woman who said, "I'm a Walker supporter." Me: "No problem. Thanks anyway." She (seeming surprised): "Thanks for being so polite about it." Me (smiling): "Thanks for thanking me." Then we both giggled, almost conspiratorially, like we were doing something slightly subversive by being so painfully, explicitly polite. I can't help but think that had we more time we could have had a good conversation about what was happening to our state. As it was, it was like catching a brief glimpse of an actual human being, beating heart and all, on the other side of a vast chasm. This past week we were given a different kind of glimpse, this one into the chasm of Walker's dark heart, not unlike his revealing and excruciatingly embarrassing tape-recorded phone call with blogger Ian Murphy posing as billionaire radical-right-winger David Koch, in which he talked about dropping the bomb on Wisconsin. On Thursday, another telling recorded conversation surfaced, this one from January 2011 with an actual billionaire donor, Diane Hendricks, who, it transpires, is Walker's most generous backer to date (having donated $510,000 to Walker's campaign so far) and owns the ABC Supply Company in Beloit, which paid not a dime in state corporate income tax from 2005 to 2008. 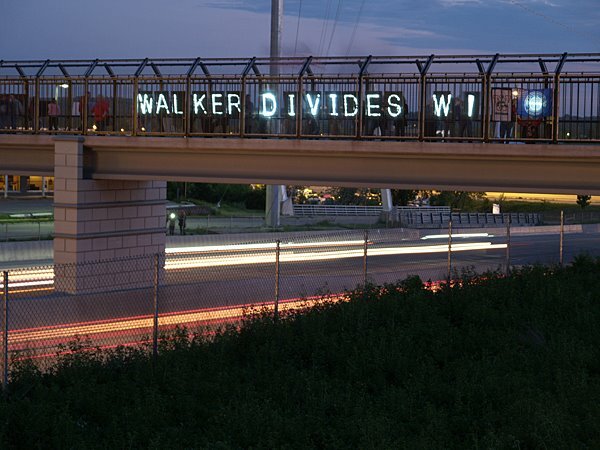 This time Walker spoke of using a "divide and conquer" tactic. Alas, that "divide and conquer" thingy has been tried before, to disastrous effect. A 1947 "Don't Be a Sucker" film put out by the U.S. War Department warns against falling for the divide-and-conquer tactic: "In this country we have no 'other people.' We are American people. ... Remember that when you hear this kind of talk. Somebody’s going to get something out of it, and it isn’t going to be you." Very prescient. 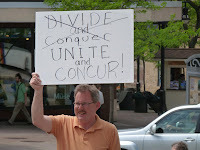 Clearly Walker's billionaire backers get something out of all this bombing and dividing and conquering. And what are the people of Wisconsin getting? The worst job performance of any state in the nation. Slashed education funding. Drastically cut healthcare. And a severely divided state. His popularity among voters has hovered around 50 percent for months, suggesting his supporters will view the admission caught on the video without consternation while his detractors will see it as confirmation of everything they already oppose about him. Thus, it seems the video, while described as 'shocking' by Barrett's campaign, will do little to sway most voters. The Marquette poll [released last week] found only a small percentage of state voters, around 4 percent, remain undecided in the June election. 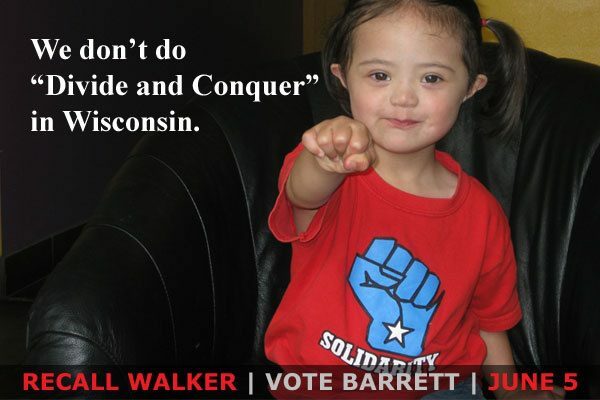 Phil Walzak, a Barrett spokesman, believes it's those voters who the Walker video could potentially impact. And for them, he says, it won’t be because the video touches on Walker's views on collective bargaining but rather because it provides a glimpse into Walker's style. We are indeed severely divided. And by all accounts it's going to be a perilously close race. Who knows who those 4 percent are and where they are? They could be anyone, anywhere. Now is not the time to politely avoid talk of politics. Now is the time to ask friends and neighbors and coworkers where they stand in the great divide. When the answer you hear sounds like it comes from one of the 4 percent, listen carefully. Have a real conversation. Those are the moments that could make or break this election. I'm reminded of Galadriel's words to the fellowship in The Lord of the Rings: "The Quest stands upon the edge of a knife. Stray but a little and it will fail, to the ruin of all. Yet hope remains, while the company is true." 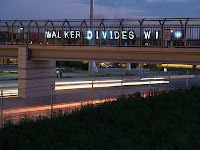 Photos courtesy of the Overpass Light Brigade, Raj Shukla, and John Pope. Video courtesy of Arthur Kohl-Riggs. Many thanks to all of you!